If you've lost the AC adapter this adjustable AC adapter might do the trick. Just slide the voltage selector to set the output at one of 7 levels between 3 and 12 volts. 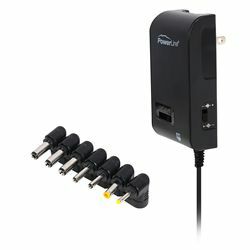 A single USB port provides 5V DC power (up to 1.3 amps) as well. Seven commonly used adapter tips are also included. Together you have an adapter for nearly every: radio, CD player, cordless phone, electronic game,speaker set, and many not mentioned!